Thank you to those of you who attended our general meeting on Supporting Caregivers of Children with Diverse Learning needs in February, as well as our executive meeting. We're very pleased to take suggestions on other topics to organize presentations on. The LRFP is the most important issue facing our district right now. The first draft of this plan was released in February -- in addition to identifying a priority list for seismic upgrades, it lays out the groundwork for school closures. The LRFP will potentially shape our district for many years -- not just for your children but for their children. It could impact schools across the district, not just those identified in the closure feasibility study. DPAC has advocated in favour of more opportunities for consultation on this plan -- both for parents as a stakeholder group and the public. We are pleased to have board staff attend our special meeting this coming Thursday, March 7th at 6:30PM regarding the Long Range Facilities Plan (LRFP) to do a Q&A. We have received nominations to the DPAC executive for Peter Couch (nominated by Simon Fraser Elementary) and Skye Richards (nominated by Magee Secondary). All PACs should have already received links for voting. Their nominations will be ratified at our next executive meeting on March 14th. There are still more open positions for parents who wish to serve in a district role for the remainder of this school year. Nominations need to be received at least 24 hours prior to an executive meeting; please contact any DPAC executive for more information. 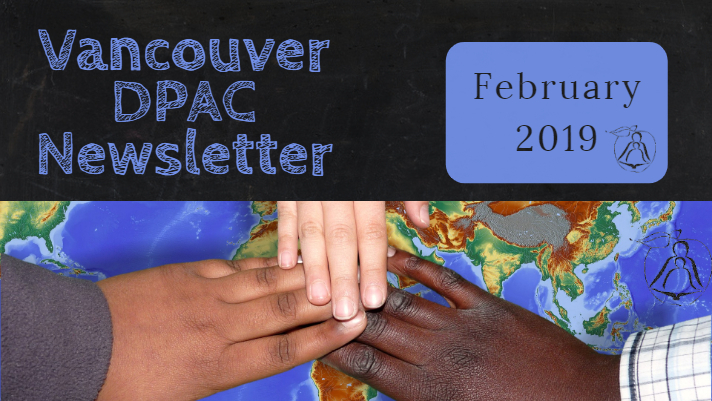 NOTE: DPAC meetings are open to all parents and guardians of children in VSB schools. Voting is limited to DPAC executives at executive meetings and PAC representatives at general meetings, but all attendees may otherwise participate in the meetings. 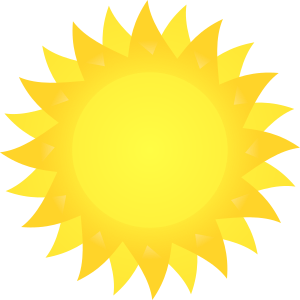 Saturday, Mar 16 - Sunday, Mar 31 – Spring Break. Improve your mental health literacy #getliterate. Lots of resources at the teen mental health website. The Plan is required by the Ministry of Education to demonstrate how the District manages facilities in an effective, economic and efficient way in support of educational goals. It contains high level information regarding facilities and facility usage in Vancouver. Any actual facilities planning will, in the future, involve input from our school communities and stakeholders. Through the Long Range Facilities Plan, the District aims to improve the overall safety and quality of schools for Vancouver students today and in the future. The draft Long Range Facilities Plan will be presented for Board approval in April, 2019. The District is proposing that the Early French Immersion (FI) program currently located at Hudson Elementary be relocated to Strathcona Elementary for the 2020-21 school year and that current Hudson students will have a choice to apply to other programs. A report (Item 2.2) was presented to the Facilities Planning Committee on January 23, 2019. The Board of Education approved a motion to support the goal of meeting the demand and to endeavour to have more than one Kindergarten FI division in each school offering the EFI program. An online survey will also be available from March 5 to March 20, 2019. Conference & AGM Details Speakers & Schedule announced. Online Registration Open. Inclusive Ed Myths There are lots of myths about Inclusive education. Have you heard any of these? How do you respond? Parent's Guide to Curriculum Review the recently released Parent’s Guide to revised curriculum. Ordinary Resolutions - March 15 Deadline (extended) Resolutions passed at the AGM form the basis for the operations and advocacy work of BCCPAC on behalf of its members. Details and forms. Feb 27 - ERASE expands to protect students from bullying. Government leaders joined together with students and education advocates to introduce new online safety sessions to help support and protect students against cyberbullying. Feb 19 - Budget 2019 creates opportunities, makes life better for people. Budget 2019 is creating opportunities for all British Columbians by delivering a new B.C. Child Opportunity Benefit for kids up to the age of 18, removing interest from B.C. student loans, reducing taxes for businesses and investing in clean energy and climate solutions. Feb 11 - Safer schools coming to better protect Vancouver students. Hundreds of families, students and staff in Vancouver can look forward to safer schools as funding for seismic upgrades has been approved for Lord Byng Secondary, Lord Selkirk Elementary and Dr. George M. Weir Elementary schools. Thank you to those of you who attended our general meeting on Cannabis Legalization & Schools and our special presentation on Anxiety in Children & Youth in January, as well as our executive meeting. We're very pleased to take suggestions on other topics to organize presentations on. Our general meeting on February 28th will have a presentation on Supporting Caregivers of Students with Diverse Learning Needs. DPAC is very focused right now on expanding our capacity to respond to facilities-related issues. The DPAC facilities sub-committee, which was struck in December, had its first meeting this past week. One of the committee's initial goals will be to prepare material to help guide PACs as their schools enter the seismic mitigation process as well as to organize a presentation on the steps that a school goes through in that process. A second goal will be to directly help the DPAC executive when major facilities initiative are undertaken by the VSB. The first opportunity for the committee to exercise the second goal will be this month when the VSB releases a draft of a major revision to its Long Range Facilities Plan. This report is critical to parents as it helps ensure that capital projects in the district are correctly identified and prioritized, but at the same time it also defines criteria which will be used to prepare a school closure list. Public consultations have thus far been excluded from the process presented to stakeholders, and I would strongly encourage parents to contact the trustees to make sure proper consultations are held. 2. Problems in PAC/admin relationships. Your input will help inform ongoing discussions with VSB senior management. Input on any other topic is always welcome, too. I'm very pleased that at least one nomination to the DPAC executive, and possibly also a second, will be received in time for our executive meeting on February 7th. There are still more open positions for parents who wish to serve in a district role for the remainder of this school year. Nominations need to be received at least 24 hours prior to an executive meeting; please contact any DPAC executive for more information. Parent Advocacy Network for Public Education (PAN) has started #BuildSchoolsRight, an online email campaign that calls on the Ministry of Education to address the issues caused by its school-design policy. The policy determines how much space, and therefore budget, will be allowed when constructing a new school. The policy leads to new schools being built on average 30% smaller than the schools they are replacing, and without crucial learning spaces such as art rooms and music rooms. Help us ensure Eric Hamber Secondary is built to accommodate current & future programs.The Eric Hamber Alumni Organization and the Eric Hamber PAC, as well as past, present, and future students, staff and parents need your help. Eric Hamber has been slated to be rebuilt but current Area Standards mean the new school won't include a lot of the important spaces the current has, including an auditorium, sport and track fields and sufficient gym space. Restore The Vancouver School Board Elementary Band and Strings program. Ask that the Vancouver School Board Trustees restore Elementary Band and Strings to its pre 2016 cut level. In addition, the VSB should put in a five-year plan to provide equitable access to Band, Strings and a Choral program across all Vancouver elementary schools. Tuesday, Feb 12, 6pm – Responding to Challenging Behaviour (more information in next section). Week of Feb 1-7 – Eating Disorders Awareness Week 2019 Awareness-raising and educational activities, use the hashtags #EDAW2019 and #ShowPurpleLove to get the word out. Wearpurple and/or a Love Our Bodies Love Ourselves wristband. 2018 WorkBC Parents’ Guide.- easy-to-use guide will provide you with information, guidelines and resources to support youth on their career journey. Have a G12 student who would like to be a mentor to an elementary student? Have them look into Learning Buddies or check out YouthVancouver for other volunteer opportunities, events and announcements for youth. Tuesday, Feb 12 6pm – Responding to Challenging Behaviour. Part of the free Child and Youth Well-being Workshops that VCH Child and Youth Mental Health Services in collaboration with the VSB are co-presenting this school year. Open this PDF, then click on the register link to enroll. Canada's New Food Guide Have you seen Canada's New Food Guide?. That the Vancouver School Board sends letters to Robert Oliphant, PM and Chair and The Honourable Ahmed D. Hussen, MP and Minister of Immigration, Refugees and Citizenship Canada (IRCC) Committee with a copy to MPs and MLAs noting the importance of making ineligible clients (students and their families) are made eligible for settlement services and programs that are delivered from within our schools and that funds are increased accordingly. District staff updated the kindergarten enrolment priorities. The new policy says, in the event existing catchment boundaries change, kindergarten siblings will be grandfathered to have enrollment priorities in the same catchment. Find out more info here: http://ow.ly/PDc130nqERK. Vancouver school food program for vulnerable kids faces 50 per cent funding cut At the Finance committee on January 23, staff mentioned this funding will get them through to June. They are working on options for September onward. Vancouver School District mulls free tampon dispensers Vancouver parent Selina Tribe has worked in concert with her school's PAC and principal to install a coin-free dispenser at Sir John Franklin Elementary. She'd like to see them in all 18 Vancouver secondary schools. A large cedar log for VSB's Legacy Carving project, in honour of Reconciliation in Education, has been delivered to the grounds beside the VSB office.We look forward to seeing its transformation. Cannabis Education Cannabis is now legal. Resources are avail to help educate yourself & youth. OECD (Organisation for Economic Co-operation and Development) Report How can education better prepare young people for the future of work? Resolutions passed at the AGM form the basis for the operations and advocacy work of BCCPAC on behalf of its members. Details and forms. Our Educational Award honours a well-rounded Grade 12 student attending a BCCPAC member school who plans to pursue post-secondary studies. The recipient will receive an award in the amount $1,000. Happy New Year to everyone and I hope you and your families have enjoyed time together over the holidays! I'd like to begin by acknowledging the DPAC executive's unanimous vote at our last meeting affirming support for the SOGI statement from the Minister of Education and other K-12 education partners. We strongly believe in inclusive and safe education spaces for all children and we continue to advocate for them. I also wish to affirm my support to those parents who brought their concerns regarding the incident at Lord Byng several weeks ago to us. I was asked to be present at the last board meeting as the issue of racism was brought before the Board and VSB staff and I've pledged support and resources to helping where we can. I sincerely hope we can have honest conversations about this issue with everyone concerned and enact just ways to remedy it. DPAC struck two committees at our last meeting and we invite input from all parents into these committees. The first committee will be focused on gathering and disseminating information related to VSB facilities work such as seismic projects, catchment reviews, and the Long Range Facilities Report and will be chaired by Allison Tredwell. Anyone interested should contact her at allison.tredwell@vancouverdpac.org. The second committee will be focused on gathering and disseminating information related to childcare spaces in Vancouver schools and will be chaired by Laura Secord parent Adrienne Denham. Anyone interested may contact her through me at chair@vancouverdpac.org. We are still seeking additional executive members to serve through June of this year. Please contact me at chair@vancouverdpac.org with interest and for information. Our next executive meeting is on January 10th, our general meeting on January 24th will be on the topic of Cannabis Legalization & Schools, and we are hosting a special presentation from Vancouver Coastal Health Child and Youth Mental Health Service on Anxiety in Children and Youth on January 31st. Attendance at our meetings is limited only to VSB parents and guardians and those permitted under the School Act. Thank you and have a good start to this year. Maple Grove's Exceptional Group runs Tuesdays 6-7:30pm from Jan 15-Feb 19. This 6-part weekly group for adults supporting neurodiverse learners. Free parent-led conversation, advocacy, resources sharing, relationship building, and more. RSVP: Inclusionandadvocacy@gmail.com (poster attached). Education and the Brain Speakers Series by Laura Secord Elementary School & Quebec Exchange Fundraising Group. Third and final talk Tuesday, Jan 22 6:30-7:30pm – Social and Emotional Learning in Children presented by Dr. Kimberly Schonert-Reichl, PhD. Doors open at 6:00, talk will begin at 6:30. This talk is geared to parents, young people and teachers who are interested in learning how education changes the brain. It will provide information how social and emotional learning impacts education and achievement. Vancouver Technical Secondary's auditorium (2600 E. Broadway) Tickets $10. Tuesday, Jan 22 6:30-7:30pm – Education and the Brain Speakers Series by Laura Secord Elementary School & Quebec Exchange Fundraising Group presents Social and Emotional Learning in Children. Doors open at 6:00. Vancouver Technical Secondary auditorium (2600 E. Broadway) Tickets $10. Thursday, Jan 31 7pm – Anxiety in Children and Youth. Rm 180, Vancouver Education Centre 1580 W. Broadway. Maple Grove School's "Exceptional Group" runs Tuesdays 6-7:30pm from Jan 15-Feb 19. This is a free 6-part weekly group for adults supporting neurodiverse learners. RSVP: Inclusionandadvocacy@gmail.com for more information (poster). Tuesday, Jan 8 6:30-8pm – FamilySmart® "In the Know" Parent Group. For parents who have children experiencing challenges with mental health and/or substance use. At the South Vancouver Youth Centre (4910 Fraser St. at 33rd). Please RSVP to jared.hazzard@familysmart.ca. Chair Janet Fraser had a conversation with Minister Fleming regarding the seismic upgrade of Edith Cavell. The minister reiterated that the upgrade was the lowest cost option, was the option that would be supported by the Ministry and the minister reiterated that the expansion project which has been put forward in the VSB capital plan would be considered with all the new capital projects in their review and the response letter would come in the spring. So no change in direction from the Ministry. Trustee Barb Parrott gave a notice of motion that the VSB support the Cavell parents in their efforts to have their school rebuilt and expanded. Minister has responded to VSB's advocacy letter on Area Standards (motion to send passed at Oct 10 Special Board meeting). That the Board commits to implementing the Truth and Reconciliation Commission’s calls to action for all Vancouver School District students, and that staff provide the Board with a report of initiatives currently being implemented to support reconciliation, as well as those planned for the future. That in light of the recent anti-black racist incident hate crime at one of our secondary schools, the Vancouver Board of Education publicly acknowledge the incident that occurred and affirm our ongoing commitment to anti-racism in the District - in particular, to the maintenance and continued development of safe and inclusive spaces for all students that are free from all types of bullying and discrimination. That the Board of Education authorizes the Board Chair to send the English Language Learners (ELL) Consortium Letter (as attached) to Vancouver's Members of the Legislative Assembly and Members of Parliament inviting them to the next ELL Consortium meeting to learn about how the eligibility criteria for federal Student Support Programs create challenges for school districts trying to support all of the students who are newcomers to Canada. That the VSB staff complete a comprehensive review of current supervision and security protocols at all elementary schools with a preliminary report to the board by no later than March 4, 2019. This would include: number of supervision aides, fencing and gates, identifying areas of vulnerability and considering the effectiveness of cameras. The goal is to determine what additional steps can be taken in the short term and what, if any, long term changes need to be made. Funding Model Review Report Education funding model review report focuses on more equitable services for students. Reconciliation Back Pocket Plan Make Reconciliation part of your daily life. Check out this "back pocket action plan". Shareable. Portable. Canadian Results in Reading Literacy 18,000+ students in Gr4 from >900 schools across Canada wrote this test for reading literacy. Education Indicators in Canada Read new publication "Education indicators in Canada: An international perspective"
New graduation program will better prepare students for the future Beginning in September 2019, British Columbian students entering their final years of secondary school will benefit from a modernized graduation program, as well as an innovative new curriculum. More teachers to be trained to bring Indigenous perspectives into classroom More British Columbia students will benefit from the traditional knowledge and culture of Indigenous peoples, thanks to a new Indigenous teacher education curriculum at Vancouver Island University (VIU). Education funding model review focuses on more equitable services for students As the next phase of renewing the Province's education funding model, B.C. 's Minister of Education is asking parents, teachers, support staff, school administrators and others to help shape the path forward to make education funding work better for students in the classroom. Funding boost helps prepare more students for in-demand STEM jobs Secondary students with a passion for coding and science, technology, engineering and math (STEM) will now have more opportunities to expand their skillsets and participate in the Play to Learn program, thanks to a one-time $230,000 provincial government grant that will expand the program. As mentioned in the above news release, a new education funding model will not be in effect for the 2019/20 school year, instead working groups will be formed in January to engage further on the key areas and themes identified in the report: inclusive education, distributed learning, adult education, financial management, accountability. The working groups will include representation by all education partners including teachers, parents, school administrators, support staff, trustees, superintendents, the First Nations Education Steering Committee and inclusive education groups. The groups will report back in the fall of 2019. The Vancouver School District Parent Advisory Council (Vancouver DPAC) would like to extend our sincere congratulations to the nine newly-elected school board trustees. We admire your dedication to public service and look forward to working with you on the board as it continues its work on behalf of the students and families of the school district. We would also like to recognize the other candidates who contributed to the conversation around public education in Vancouver throughout the election cycle, especially those who attended our forum earlier this month. We hope you continue your advocacy, and perhaps we will see some of you in the next election. All trustees are able and welcome to attend DPAC meetings and we invite each of you to use this opportunity to meet and interact with many of the engaged parents and guardians in the school district once you are sworn in. Hello, my name is Allison Tredwell. I am currently the DPAC Rep for Edith Cavell Elementary, where I have a daughter in Grade 1, and a son who will start kindergarten in 2019. I began attending DPAC meetings around May 2018, during the Boundary Catchment Review. It was at this time that I realized that all these potential changes had been in the works for months, and that parents have the opportunity to have a voice with the VSB through DPAC. I am interested in facilities and planning (such as seismic mitigation, boundary catchment review and the potential policy changes that may be involved), sustainability and environmental impact, emergency preparedness and response (including reunification processes, and fire/earthquake/lockdown procedures/drills). I am also interested in increasing inclusiveness in schools, and I fully support SOGI education. I currently work as a TTOC (teacher, teaching on call) for the Richmond School District. I TOC at the secondary level, for almost all subjects, but my background is in physical geography and biology. I think of myself as a logical, organized person, who appreciates honest and direct constructive criticism. I hope that these traits, as well as my perspective as a TTOC and parent, will be an asset to DPAC. I’m committed to regularly attending both general and executive meetings, as well as volunteering for other committees/events as needed. Thank you for considering me for DPAC Exec. An electronic ballot was sent to PACs following this meeting with voting to close on October 31, 2018 at 7pm. If you are the DPAC Rep or Chair of a PAC and you have not received the ballot please contact us. We asked all 33 trustee candidates the same 19 questions. See who responded and what they said here …. and join us tonight at Charles Tupper Secondary for our school board candidate forum where you can ask them your questions. UPDATE: Revised document with responses from candidate Sophia Woo here. UPDATE 2: Revised document with responses from candidate Ken Denike here. My name is Gordon Lau. I have children at Trafalgar Elementary school in grade 3 and 6. I have been an active member of our school PAC since the first day of kindergarten. I was co-chair for our PAC for three years (2014-2017). My participation with the DPAC started in Spring 2017, when we discovered that our school was one of five French immersion schools to lose a kindergarten class. At that time, I worked with the DPAC to better understand the root causes behind the changes and to ensure that the parent voice was heard at the VSB. Since then, I have been the DPAC representative for our school and the parent representative on the VSB French Immersion Working Group and Digital Strategy Working group. Having seen first-hand the amount of time it takes to engage with the VSB through working groups, I want to help. Based on my experience with the working groups and the French immersion changes, I feel that I have the skills and attitude to engage with the VSB and represent the concerns of Vancouver parents and students. Thank you for your consideration in electing me to the DPAC executive. An electronic ballot was sent to PACs following this meeting with voting to close on October 10, 2018 at 7pm. If you are the DPAC Rep or Chair of a PAC and you have not received the ballot please contact us. First, I'd like to extend a big thank you to everyone who participated in our PAC 101 meeting this past week. About 65 parents from 45 different schools attended and engaged in excellent discussions ranging from the big-picture view of public education in BC, to the three levels of parent representation in the system (BCCPAC, DPACs, PACs), to discussions of the rights and responsibilities of PACs and examples of PAC best practices. I'm pleased that two significant themes to emerge from these discussion were community and advocacy. Some PAC leaders spoke very eloquently about changing the culture in their schools by making community building a cornerstone of their practice. Others spoke very passionately about the need to advocate to simultaneously make the system better and to reduce inequities between school communities. Second, election season is upon us. DPAC is committed to political neutrality and will not endorse any candidates. We are, however, in keeping with our mandate, hosting a school board trustee candidates forum on October 4th (details below) as a way of bringing information about the candidates to parents. The format of this forum will allow parents to directly ask candidates questions, so please take advantage of this opportunity and come participate. We very much look forward to working with the new board after the election. Third, we are looking to increase the capacity of the DPAC executive. We currently have 6 open positions which we would like to see filled as soon as possible. A nomination has already been received from the Trafalgar PAC to elect Gord Lau to the DPAC executive and an electronic ballot has been sent to PACs as part of our election process. Please contact us if your PAC did not receive this ballot. Finally, I'd like to invite all interested parents and guardians to attend our October general meeting on SOGI 123 with presenters Matt Carruthers (former SOGI District Lead) and Renee Hock (VSB Diversity Mentor). In particular, I would like to invite parents who have concerns with SOGI education in schools to attend to begin a dialogue. We will have translation services available for parents who require them. Thursday, Oct 4 6:30-9pm – DPAC's VSB Trustee Candidate ForumModerated by Tracey Sherlock. Sir Charles Tupper Secondary Cafeteria. We have invited 31 candidates (if anyone has contact info for Gordon T. Kennedy or Mrs. Doubtfire, please let us know) and sent them a questionnaire to complete (responses will be posted on our website). A portion of the evening will be spent with candidates answering your questions, so please bring them. Thursday, Oct 25 7-9pm – DPAC General Meeting: SOGI 123. Rm 180, Vancouver Education Centre 1580 W. Broadway. Presenters include Matt Carruthers (former SOGI District Lead) and Renee Hock (VSB Diversity Mentor). We will have translation services available for parents who require them. Agenda will be posted on the vancouverdpac.org website when finalized. Thursday, Nov 15 7-9pm – Provincial ADHD Clinic facilitated ADHD workshop for parents and caregivers. Rm 180, Vancouver Education Centre 1580 W. Broadway. More details will be provided when they are finalized. NOTE:DPAC meeting are open to all parents and guardians of children in VSB schools. Voting is limited to DPAC executives at executive meetings and PAC reps at general meetings, but all attendees may otherwise participate in the meetings. Wednesday, Oct 24 6:30 – Southlands PAC presents: Fostering Gratitude & Kindness in Children. A parent education presentation by Dr Carla Fry and Dr LIsa Ferrari, directors of the Vancouver Psychology Centre at Southlands Elementary (5351 Camosun St.). Presentation is free. RSVP to Southlands.elementary.events@gmail.com. Thursday, Oct 4 6:30-9pm – DPAC's VSB Trustee Candidate Forum Moderated by Tracey Sherlock. Sir Charles Tupper Secondary Cafeteria. More details above. Thursday, Oct 11 7-9pm - DPAC Executive Meeting, Rm 120, Vancouver Education Centre 1580 W. Broadway. Agenda will be posted on the vancouverdpac.org website when finalized. Saturday, Oct 20 - Municipal Election Day, If you are at least 18 years old, a Canadian citizen, have lived in BC for at least the past 6 months and in Vancouver (or owned property in your name) for at least the past 30 days, you are probably eligible to vote. Please do. Follow the link if you have any questions. This vote will determine Vancouver's mayor, city council, parks board and school board. Thursday, Oct 25 7-9pm - DPAC General Meeting: SOGI 123 Information Session. Rm 180, Vancouver Education Centre 1580 W. Broadway. Information and discussion on SOGI (sexual orientation and gender identiy) and SOGI 123 which are the provincial resources. City of Vancouver resources, including how to register, where to vote, and who is running. Special Kids Vote Program - On Saturday, Oct 13 and Sunday, Oct 14, children under 18 can go to any advance voting location and vote on three questions printed on special pink Kids Vote ballots. Who to vote for - as DPAC is non-partisan, we won't tell you, but please attend candidate forums, read candidate material, ask questions ... and attend our school trustee candidate forum on Oct 4 (more information above). BCEDAccess's 3rd annual Advocacy Conference is on Saturday, Oct 6 8:30–5pm. Tickets include a full day of workshops, lunch, snacks and annual membership. Save the date, DPAC is hosting a Provincial ADHD Clinic facilitated ADHD workshop for parents and caregivers on Thursday, Nov 15 7-9pm in Room 180, Vancouver Education Centre 1580 W. Broadway. The Office of the Privacy Commissioner of Canada has created a graphic novel, Social Smarts: Privacy, the Internet and You, to help young Canadians to better understand and navigate privacy issues in the online world. Vancouver Board of Education revises its governance model - at the Board meeting on September 24 the board voted to adopt a new board policy handbook and received an Administrative Procedures Manual (previously the two manuals were combined). Seismic project announcements for General Wolfe and Edith Cavell elementary schools - on September 28, Minister of Education Rob Flemming announced that the government of BC is providing $35.8 million combined for the seismic upgrading of Cavell and Wolfe elementary schools. Construction on both schools is expected to begin in spring 2020 and be ready for students in fall 2021 leaving the heritage structures of both facilities intact. Up to $2.0 million for the construction of a play field at the Lord Roberts Annex site following completion of the substation construction, anticipated in 2028. Membership Renewal - Its time to renew! Membership year is Sept 1-Aug 31. Parent's Guide to New Curriculum - Review the recently released Parent’s Guide to BC’s new curriculum. Scholarships for Students - Scholarships for high-school grads to recognize achievement & encourage post-secondary education. Learn More! Personal Acts of Reconciliation - 10 simple actions you can do to learn and do more about Reconciliation. Find out! Province celebrates new French teacher education students and expands training efforts - 37 additional French teacher training spaces filled this year and an investment in new spaces. “All of B.C.’s provincial education partners for K-12 schools are committed to ensuring every school — both public and independent — is a place where students feel safe, accepted, respected and welcome regardless of their sexual orientation, gender identity, race, religion or background. In 2016, the B.C. Human Rights Code was amended to ensure that gender identity and expression are protected under the code. There is no room for any type of discrimination in our schools. There's no more interesting time to be a parent volunteer in Vancouver public education than today: we have a school board election coming up in October (DPAC will be hosting a trustee candidate forum on October 4th); the deadline for teacher contract negotiations is coming up next June (wasn't the last strike fun? ); the VSB is continuing its downtown and False Creek catchment review as well as its choice program review; and there are still reports of teacher shortages across the province. Last year DPAC worked to improve our relationship with the VBS senior management team. This is important as we are a stakeholder within the VSB, but also because we want there to be enough trust for the VSB to share important information with us and with parents. We've been pleased to have Superintendant Suzanne Hoffman at many of our meetings to provide updates and answer questions and we hope to continue this custom. One of our core goals is to become an effective two-way information conduit between PACs and the VSB, providing information to PACs about the goings on in the district and providing feedback from PACs to the VSB. A good example of this was our May general meeting which brought parents and representatives from the VSB together to have real conversations about the catchment review and which ultimately helped the VSB rethink its process. Come to a relaxed and interactive session with SACY parent engagement facilitators to discuss innovative ways to engage folks with their schools. We’ll explore what’s working across the district to build parent-school engagement and how that contributes to social, emotional and academic success of students at secondary school. Register: www.SACY.eventbrite.ca. Thursday, Sept 13 7-9pm - DPAC Executive Meeting, Rm 120, Vancouver Education Centre 1580 W. Broadway. Agenda will be posted on the vancouverdpac.org website when finalized. Thursday, Sept 27 7-9pm - DPAC General Meeting: PAC 101. Rm 180, Vancouver Education Centre 1580 W. Broadway. Information and discussion of benefit to new and returning PAC executives as well as all parents. Agenda will be posted on the vancouverdpac.org website when finalized. Thursday, Oct 4 6:30-9pm - DPAC's VSB Trustee Candidate Forum Moderated by Tracey Sherlock. Sir Charles Tupper Secondary Cafeteria. Agenda will be posted on the vancouverdpac.org website when finalized. NOTE:All DPAC meetings are open to parents and guardians of VSB students. While only DPAC executives can vote at Executive meetings, and only official DPAC representatives (PACs to self-determine) can vote at General meetings, all parents and guardians of VSB students can participate. Attend DPAC meetings. Join in the discussion, hear what's going on, talk to other parents, enjoy some light refreshments. Childcare provided onsite for General meetings when requested in advance. Monday, Sept 10, 7-8:30pm - SACY facilitated workshop "Engaging Parents at the Secondary School Level"Hosted by DPAC. VSB Education Centre 1580 W. Broadway. All parents and caregivers welcome. RSVP (free). More details above. Tuesday, Sept 11, 6:30-8pm - Family Smart Parent Group monthly meeting topic "Building Relationships Between Home and School" featuring Langley district consultant and retired principal Lucy Lenko. South Vancouver Youth Centre, 4910 Fraser St @ 33rd Ave (parents only, no kids or childcare provided, unfortunately). Please register by RSVPing to jared.hazzard@familysmart.ca. More details in next section. Thursday, Sept 27, 7pm - DPAC General Meeting: PAC 101. Room 180 VSB Education Centre 1580 W. Broadway. Thursday, Oct 4, 6:30pm - DPAC's VSB Trustee Candidate Forum Moderated by Tracey Sherlock. Sir Charles Tupper Secondary Cafeteria. VSB News "Back-to-School Tips: How to help your child get a terrific start"
BCEDAccess Blog "Back to School - 8 things you can do to prepare your child with special needs"
Tune into CBC News Sept 4-7 for their special series "Beyond Beads and Bannock" which will be taking an in-depth look at Indigenous curriculum in BC schools. Until Oct 21 you can follow this link to read "Indigenous and Decolonizing Studies in Education" edited by Linda Tuhiwai Smith, Eve Tuck and K. Wayne Yang. Indigenous Peoples Atlas of Canada. News article: New atlas of Indigenous Peoples reveals country 'before the lines were drawn' Scheduled to be released for sale at the end of summer. New dictionary published for Indigenous Vancouver Island language. It contains more than 12,000 words in SENĆOŦEN, the language of the W̱SÁNEĆ First Nations on Vancouver Island's Saanich Peninsula. Calendar - a year-at-a-glance 2018-19 School District calendar which includes Statutory holidays and non-instructional days such as Professional Development Days (Pro-D's) (Note, a couple Pro-D's are flexible, so check with your child's school to confirm their dates). There also is a 2018-19 Secondary School District calendar which includes the Day 1/Day 2 schedule, If you are interested in attending VSB Committee and/or Board meetings, see the Board Calendar of Events. How to Solve a Concern at School - download the brochure "VSB Conflict Resolution Process for School-Based Concerns." Fluent in another language and have time to volunteer? VSB has a Volunteer Program. School Directory - a quick way to find out some basic information for each VSB school, including: address, website, principal, trustee, director of instruction, education coordinator, and programs. We will update you when we know more about what the planning and consultation for 2018/19 will look like. VSB's updated website includes their mission statement and recent statistics on enrollment, diversity and schools. Mission: To enable students to reach their intellectual, social, aesthetic and physical potential in challenging and stimulating settings which reflect the worth of each individual and promote mutual respect, cooperation and social responsibility. Current job postings for VSB on Make-a-Future. As of Sept. 1, 12 teaching positions and 19 support positions were posted. Some positions have more than one opening. Current graphic on staffing and student numbers for 2018/19. Gaming Grants Reporting - PACs/DPACs must submit a Gaming Account Summary Report annually within 90 days of their fiscal year end. Bylaws Updated - Most recent changes from the May AGM approved and submitted to the Societies Act Registrar. Have thoughts on how the government of BC should prepare its budget? Think about presenting or submitting to the Select Standing Committee on Finance & Gov't Services on their Budget 2019 Consultation. Online registration for public hearings opens Friday, Sept 7 at 9:00am for their Vancouver consultation on Sept 24. As the VSB 2018/19 budget was passed with funds to cover the EHT starting in January 2019, DPAC looks forward to seeing how these funds will be reassigned to benefit our students. * Update, June 22, 2018: Since our AGM on Monday, we have been contacted by the PAC chairs from both Laurier and Southlands who informed us that the nominations for Chris Zhang and Derek Palaschuk, respectively, do not meet DPAC's eligibility criteria for election to the DPAC executive. As a result, we have invalidated their nominations and nullified their elections to the DPAC executive. Both Chris and Derek have been informed of this decision and have been invited to seek nominations again in September if they still wish to join the DPAC executive. Since Derek was also elected Treasurer at our AGM, Shaun and Amanda will share the responsibilities until a new Treasurer can be elected. Unless otherwise stated, all meetings will take place at the Vancouver School Board at 1580 West Broadway. Executive Meetings are in Room 120 and General Meetings are in Room 180. DPAC meetings are open to all parents and guardians of VSB students. DPAC's 2018/19 Budget was amended and approved. Will be posted to website by the end of the month. The Treasurer went over DPAC spending over 2017/18. Mostly due to the fact that the budget allowed for a contracted support person and this position has not been filled since November, there was a large surplus. After discussion with the PAC representatives, it was decided to evenly divide the surplus funds from DPAC's 2017/18 VSB budget between the Tier 1-3 schools. These are schools determined by VSB to qualify for Enhanced Learning Services because they support a high number of vulnerable students and families. The proposed revisions will be made accessible to the PACs by the end of June to receive feedback and suggestions before the September 13 Executive meeting. 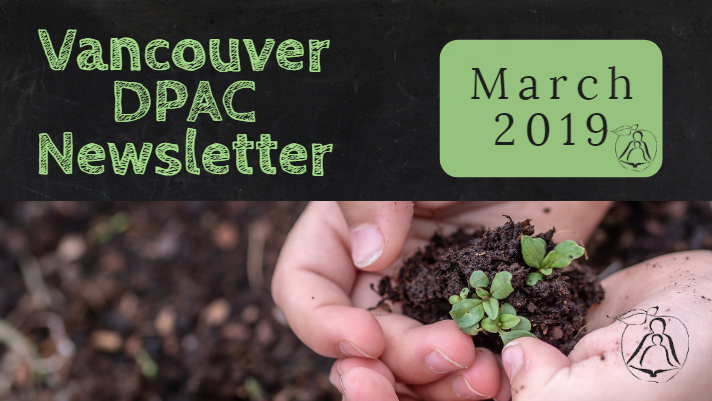 DPAC is very appreciative of the parents and guardians who step up to volunteer on VSB advisory and ad hoc committees, DPAC committees, and volunteer their skills to help DPAC run smoothly. We've made it to the last month of this school year and the final two DPAC meetings of 2017/18. Our Executive Meeting is on June 7th and our Annual General Meeting (AGM) is on Monday, June 18th (please note the date change ... this meeting has been moved to the Monday to avoid conflict with National Indigenous Peoples Day). Note: all DPAC meetings are open to parents and guardians of VSB students. While only DPAC executives can vote at Executive meetings, and only official DPAC representatives (PACs to self-determine) can vote at General meetings, all parents and guardians of VSB students can participate. Monday, Jun 4 - Sunday, Jun 10 – BC Child & Youth In Care Week. Vancouver event on Wednesday, Jun 6 at the Broadway Youth Resource Centre (2455 Fraser St) with live entertainment, giant art canvas, food, games and more. RSVP by June 4 to info@fbycicn.caor join their Facebook event. Wednesday, Jun 6, 5pm – Committee I - Management Coordinating Meeting, VSB Education Centre 1580 W. Broadway - includes school fees, livestreaming board & committee meetings, and naming/renaming policy. Wednesday, Jun 6, 6pm – Committee III - Education & Student Services Meeting, VSB Education Centre 1580 W. Broadway - includes recommendations from the French Immersion Program Review. Monday, June 18, 7pm – DPAC Annual General Meeting (AGM). VSB Education Centre 1580 W. Broadway. Do you know someone, or are someone, who would make a great DPAC executive or DPAC table officer next year? Please get your PAC to sign off the nomination form and submit to DPAC before June 18th. We've made some revisions to our bylaws we'd like to have ratified at the AGM including making one of our executives-at-large seats for an Indigenous parent. PACs and DPAC reps please keep an eye on your inbox as we hope to have these and a proposed budget for 2018/19 out to you early next week. Current by-laws here. At our May 24 General Meeting, General Gordon brought two motionsforth regarding the proposals which we forwarded to VSB. Participate in National Indigenous Peoples Day including events at Trout Lake and Fort Langley. Trustees will vote on 2018/2019 Operating Fund Budget Preliminary Draft Version #2 (presented on Wednesday, May 2) at the June 25 Board Meeting. Stakeholders will discuss at the newly announced June 20 Committee II - Planning & Facilities Meeting starting at 5pm. Individuals or delegations wishing to appear before Standing Committee II should contact Lois Schack (604-713-5019 or lschack@vsb.bc.ca). Trustees will vote on whether or not to accept the proposal at the June 25 Board Meeting. Teacher and Teacher Support Staffing Update Report presented at May 16 Committee IV meeting. At the BCSTA (British Columbia School Trustees Association) AGM and the BCCPAC Conference, Rob Fleming, Minister of Education acknowledged that construction costs have increased so area rates for school construction will be increased. In addition school area standards (how much space & what it’s used for) will be updated. At our general meeting last night, two motions were tabled by the General Gordon PAC and passed by the PAC reps in attendance. DPAC thanks the General Gordon PAC for its commitment to these issues and we will be bringing them forward both to the VSB senior management and the trustees for further discussion. We propose the DPAC writes a letter to VSB in support of parents advocating for the following: If the VSB passes the proposal to change the school catchment maps that siblings are included in the grandparenting policy. In other words, if a family home is rezoned by VSB out of their current school boundary, where their older children are already attending school, the siblings enrolling in 2019 or later retains priority enrolment status akin to in-boundary-siblings. This will maintain school security, childcare security and keep our children's communities together. We propose that the VSB be encouraged by DPAC to hold a feedback meeting inviting parents affected by the sibling policy (if catchment maps are rezoned) to have a chance to speak directly with Trustees and Planners to explain the hardships this policy poses to them if it passes without being amended to grandparent in siblings. Following the announcement that Brock Elementary would be receiving a new playground as part of the provincial government's new Playground Equipment Program, DPAC asked the VSB to help clarify the criteria that are looked at when such decisions are made and to provide guidance on the question we have received from multiple PACs, "Should we stop fundraising for a new playground?" Here's the answer we received. Please forward us any questions and we will update this page with new information as it becomes available. Although the Ministry does ask for the amount of fundraising to date, this does not necessarily factor into the decision of what project is approved. given that there are a maximum of three submissions per year per district, it will take a significant time to get to our 90+ elementary schools. So to answer the PACs question, ‘should we stop fundraising?’, I believe the answer is ‘no’, given points 1) and 2) above. For accessible playgrounds, the number of students with special needs designations of physically dependent. The Ministry considers that three projects per year for each district (regardless of size) does not take into account the size of the larger districts, so the Ministry will be considering how to factor that district size differential in the future of the program. DPAC has two meetings this month. Our Executive Meeting on May 10th will be hosted by Xpey' Elementary PAC at the Aboriginal Friendship Centre Society (1607 E Hastings). Our General Meeting will be on May 24th with a focus on potential catchment boundary changes and the proposed BC Hydro substation under Lord Roberts Annex site in the West End. Both of these items will be decided at the June 25 Board Meeting. Wednesday, May 2, 7pm – VSB Plenary Committee III / V Meeting, VSB Education Centre 1580 W. Broadway - revised 2018/19 budget will be presented and discussed. Saturday-Sunday, May 5-6 – BCCPAC AGM. If your PAC is a member and you're not sending any representatives, contact DPAC with your proxy vote. Tuesday, May 8, 6:30pm – Raising Digitally Responsible Youthworkshop at Prince of Wales Secondary. RSVP for free tickets. Wednesday, May 9, 6:30-8:30pm - Fenatanyl Crisis Forum. John Oliver auditorium. No registration required. Thursday, May 24, 7pm – DPAC General Meeting. VSB Education Centre 1580 W. Broadway. Focus on catchment boundary review and BC Hydro substation at Lord Roberts Annex proposals. Thursday, May 31, 6:30-8:30pm – SACY workshop "Adult Toolkit: Understanding Youth and Substance Use" in the SACY STEP Portable at Tupper Secondary. Seating limited. Please register. May 28-June 1 – Bike to School Week. Register your school now! Jared Hazzard, FamilySmart® Parent-in-Residence for Vancouver, presented at our April 26 Executive Meeting. FamilySmart® PiRs are parents with lived experience caring for children with mental health and/or substance use challenges. Jared is available to connect with other parents in the district as a resource and support, to host a resource table at local events, and to speak publicly about his experiences as a parent. He will also be hosting a monthly “In the Know” community group for parents. Parents or PAC representatives can connect directly with him at jared.hazzard@familysmart.ca. Resources for the May 7th Child and Youth Mental Health Day can be ordered or downloaded directly from familysmart.ca. DPAC By-laws. Think there is room for improvement in DPAC's by-laws? We do! We updated some of them last year, but are looking for suggestions on areas to change/update this year in time to present them at our AGM on June 21st. Current by-laws here. Send input to Shaun Kalley (vicechair@vancouverdpac.org). Will be discussed during the May 10 Executive Meeting. 2018/19 General Meeting topics. Tell us what you want to learn about. DPAC 2018/19. Succession. Our AGM is on June 21. Do you know someone, or are someone, who would make a great DPAC executive or DPAC table officer next year? Time to start thinking about it and getting your PAC to sign off the nomination form. Search your location to find out whose traditional lands you are on. If you have a teen interested in journalism, send them to Indigenous Junior J School on Thursday, May 17. Indigenous J School is the brainchild of Steve Sxwithul'twx who offers workshops to engage teens in a participatory way by getting them to try out a broadcast camera and use professional recording devices. Students will also hear from several Indigenous CBC employees about their reasons for choosing this career. Post-secondary schools will be on hand to talk about the programs they offer. This workshop is put on by CBC Vancouver in partnership with Musqueam First Nation and the Indigenous Education Department of VSB. View the PowerPoint for more information on the report. A revised budget will be presented and discussed on Wednesday, May 2 in Plenary Committee III / V Meeting at 7pm. While only stakeholder representatives can participate, the public is welcome to attend. In the new timeline, the trustees will be voting on the budget at the June 25 board meeting. Proposed changes (will be provided at the open houses) would come into effect in September 2019. Students currently enrolled at any of the impacted schools are not affected. The Ministry's response to VSB's June 2017 Capital Plan submission was discussed at the April Committee II meeting. Since then we have received clarification that funding for creating a school at the Coal Harbour site would have to come from an agreement with BC Hydro and not the provincial government. The board has not made any agreements with BC Hydro to date. The decision will not be made until the June 25 board meeting. Teacher and Teacher Support Staffing Update Report presented at April 18 Committee IV meeting. Read Tracy Sherlock's April 30 article in the Vancouver Courier "The good, the bad and the challenging: A breakdown of B.C. class sizes" which is based on the BCTF's report "Summary of BC Ministry of Education Annual Class Size and Composition Data 2003-2018 which uses Ministry of Education's data set. Conference theme is Human Rights with keynote address by Ivan Coyote and feature speaker, Rick Hansen. BCCPAC and the BC Ministry of Education created some resources to answer parent questions about what SOGI-inclusive education looks like in BC schools: presentation and facilitator's guide. At the BCSTA (British Columbia School Trustees Association) AGM, Rob Fleming, Minister of Education acknowledged that construction costs have increased so area rates for school construction will be increased. In addition school area standards – how much space & what it’s used for – will be updated. (via Tweet from VSB chair Janet Fraser).